In the United States, the federal government recognizes Indian tribes as independent and sovereign powers. Sovereignty is the right of a nation or group to self-govern. Indians are United States citizens and also citizens of their tribes. Like all Americans, Indians are subject to federal laws. But they are not always subject to state laws because Indian reservations are held in trust by the federal government. Today, eleven federally recognized Indian tribes call Wisconsin home. The U.S. Constitution has always guaranteed tribal sovereignty. But historically, the actual status of Indian tribes has been contested. Chief Justice John Marshall defined the limits of Indian sovereignty in the 1832 case Worcester v. Georgia. 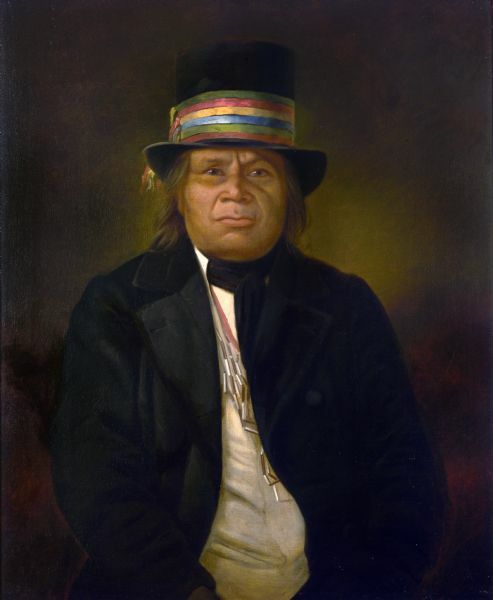 Marshall maintained that Indian tribes had been treated as independent and sovereign nations since the arrival of Europeans, but that the treaties that put tribes under the protection of the United States terminated their status as independent nations. Instead, Marshall termed them "domestic dependent nations." Tribes retained the right to regulate their own affairs but they could not make agreements with any nation other than the United States. The United States continued to make treaties with Indian tribes until 1871. The U.S. government stopped making treaties because it thought they prevented Indians from assimilating into white society. To encourage assimilation, Congress passed the General Allotment Act of 1887 — also known as the Dawes Act. The act transferred the status of tribal lands from communal properties to individually owned eighty acre parcels. Instead of tribal land belonging to the whole tribe, it was broken up and given to individuals. After the allotment process was completed, the federal government sold the "excess" land to whites. The government believed this plan would expose Indians to the civilizing effects of mainstream American society. But allotment proved a dismal failure. By the time it ended in 1934, tribes like the Ojibwe had lost more than forty percent of their homelands. Congress passed the Indian Reorganization Act — IRA — in 1934. 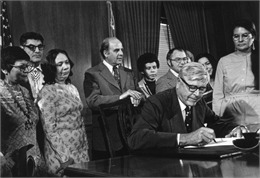 For fifty years, the federal government's policy assimilation; the government tried to force Indians to give up their languages, cultures and identity in favor of white culture. The IRA encouraged tribes to form their own tribal governments to conduct their internal affairs. The new tribal governments provided tribes political bodies that could assert their sovereign rights. Critics of Indian sovereignty led a federal effort to dissolve the reservation system in the 1950s. They wanted to free the U.S. government from the costs of protecting Indians. The House Concurrent Resolution 108 passed in 1953. It developed the goals of "termination and relocation," a policy intended to encourage Indians to move from rural reservations to urban areas and give them job training and housing assistance. Most Wisconsin Indians who relocated got one-way bus tickets for Chicago, Milwaukee or St. Paul. The Termination and Relocation policy ended federal recognition of over fifty tribal governments. The Menominee were one of the first tribes terminated. The federal government felt that the Menominee had the economic resources to succeed without government support. On April 30, 1961 the Menominee reservation was terminated. It became Menominee County. A new corporation called Menominee Enterprises Inc. oversaw the tribe's finances and property. Without federal funds, the tribe was forced to close its hospital and lay off mill workers. A grassroots group named Determination of Rights and Unity for Menominee Shareholders — DRUMS — formed to restore Menominee status as a federally recognized tribe. 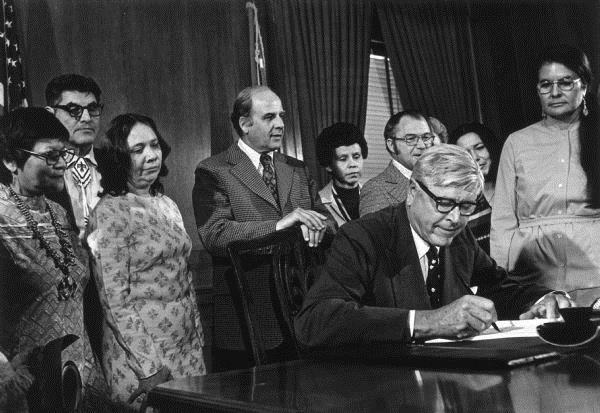 Menominee County reverted back to reservation status in April of 1975. 19th century treaty negotiations usually allowed Indians continued access to their former lands. But in the 1970s, off-reservation treaty rights became a controversial issue when two brothers from the Lac Courte Oreilles band of Ojibwe were arrested for off-reservation spear fishing. They appealed their conviction. In 1983, the U.S. court of appeals ruled in favor of the Lac Courte Oreilles band. The Great Lakes Indian Fish and Wildlife Commission formed in 1984 to educate the public and help tribes protect their treaty rights. A state referendum approved the creation of state lottery in 1987. It also inadvertently gave Wisconsin tribes the right to establish casino style gambling. Many tribes such as the Ho-Chunk, Ojibwe, Mohican and Potawatomi opened casinos, which provide economic benefits today. For more than a century, Wisconsin tribes have fought to maintain their sovereignty and self-determination in the face of federal policies of assimilation, allotment, and termination. In the last generation, the tribes' legal status has been clearly defined, their traditional treaty rights guaranteed, and their economic base boosted by gaming and tourism.